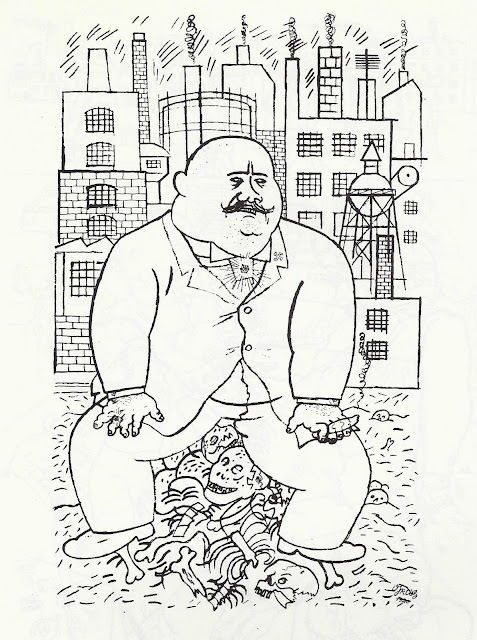 From a 2001 edition of NYC's Theater Talk program, the entire interview with Al Hirschfeld as conducted by guest-interviewer Art Spiegelman. FLASH GORDON by Jim Keefe and copyright King Features Syndicate. Comic books, comic strips, illustration -- you name it and my friend, cartoonist Jim Keefe, has done it. Jim has a good blog and he's offering some hands-on advice on what to charge for a comic book in his entry this week: Pricing Your Work. He goes into detail -- giving more resources for contract negotiation and generally citing the fact that small companies tend to pay less than the big companies. I agree with Jim that if you initially set your price low (or just decide to give it away for, you know, "the exposure"), then you may be saddled with that for a long time. That precedent may ruin your career. For example, you decide to give a client a break and draw finished pages for the ridiculous amount of $25 each. It's a free country. You can set up a crazy deal like that. Anyway, so the deal penciling, inking, coloring -- the whole visual thing, from blank page to finish. And you do all the work, on time and it looks great. Then another client comes around with another request ... and word has got around that you do great work for $25 a page; that this is "your rate." It's just not a livable, viable deal. Anyway, bookmark Jim Keefe's invaluable blog. There's more about Work For Hire, Back End Deals and, generally, how to handle making a living by drawing. Jim's blog is a great place for real world information. There is a lot of visual inspiration and/or kitschy fun at an antique store. The Laconia (NH) Antique Center has a lot of great material for inspiration. Here are a few photos I took when I was there. JIMMY'S COLORING BOOK is, as you can see, a coloring book of Jimmy Carter. I looked at the cover and sure thought it was drawn by one of the Mad Magazine guys. Maybe Angelo Torres. But NO!!!! The cover was drawn and signed by none other than the great Neal Adams! The Magic Stay-On Dresses teach the important fact that clothes should fit and stay on! Love this painted box cover to "Kindergarten Compendium, 5 Popular Pastimes for Kiddies." It includes bead mosaic, stencil outfit, sewing cards, basket weaving and little knitter. The "Game of India" has this cartoon elephant in a turban, with what looks like club-weilding dog and bunny bodyguards. The Bingo box art is typical: colorful, fully rendered paitings of white kids have lots of wholesome fun. Story-a-Day was a magazine that had seven stories for kids in it and it's full of fun 1950s commercial art. They are, however, rather pricey. Putting a graduation cap and granny glasses on a bear does not make him appear wiser. Why wasn't the owl (opposite, left) made to be the smart one? Above and below are the cover and first page of HUCKLEBERRY HOUND CHUCKLEBERRY TIME, an oversized comic from 1960. That cat always looked way too mean to me. Dale Evans wrote "The Bible Tells Me So?!?!" News to me! Here's an empty sack, that used to be full of something call Wirthmore Baby-Chick Starter. It's one of the few times I have seen an in-cute drawing of baby chicks. I guess that's to show how serious the Wirthmore people are. For sale: an old bag of rubber worms. Here's a, um, er, squirrel, I think, eyeballing the Storze Beer logo. 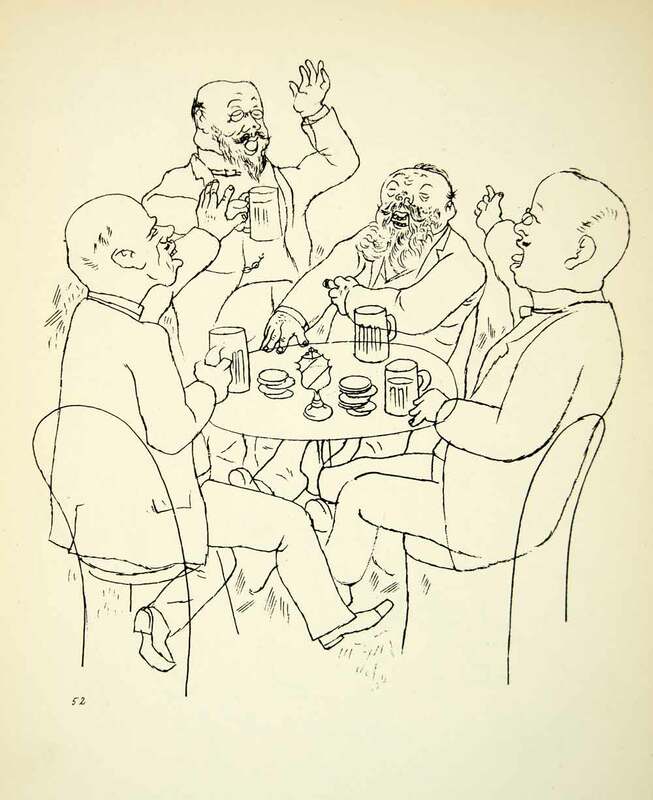 Storz, the beer as "refreshing as the whole outdoors," was a Nebaska-based brewery from 1863 to 1972. I've enver heard of it, but the place has its own Wikipedia page and many items on eBay. And there were also a series of posters below, depicting kids at play, cute babies, the nativity, father and sons fishing and so on. These look like promo posters that salesmen would hawk to stores. Each one has a space above for the store's logo. Here's a nice old poster for Claudette Colbert, Joan Bennett and Charles Boyer in PRIVATE WORLDS -- as well as upcoming attractions FOLIES BERGER and George Arlis in THE IRON DUKE, This has terrific visual impact, regardless of the fact it's 2 colors with only the one graphic of the head of Colbert. The movie came out in 1935. A book of recipes from a chef of a long-forgotten regional chain. Everything, as Don motions to us, will be okay! Some signs from Bond Bread: "The Lone Ranger says ... 'Let Safety Be Your rule for the Honor of Your School!' Always Be Careful!" This little sign, which has a handy 8 inch ruler on the top, was "prepared in the interest of the safety education by the Bond Bread Bakers." Last Day to Experience MoMA's "Rain Room"
MoMA's "Rain Room"exhibit closes today. It's the last chance to walk in the rain without getting wet. Digitally choreographed rain falls around a person, whose path is tracked with motion sensors. The sensors create a real-time dry "walking between the raindrops" path. The exhibit hours had been extended from a 5:30 closing time to midnight and waits in line to get into the Rain Room were up to nine hours. One hopes that the exhibit will travel. Gothamist: Photos: Walk Between The Raindrops At MoMA's New "Rain Room"
I just saw that a children's book illustrator has been told NOT to draw a fire-breathing dragon so as not to incur liability lawsuits. Political correctness has gone cuckoo! If it was up to the watchdogs, Lewis Carroll, the Brothers Grimm, L. Frank Baum -- all of 'em -- would be cold, destitute and on the breadlines! You wanna see unpolitically correct? 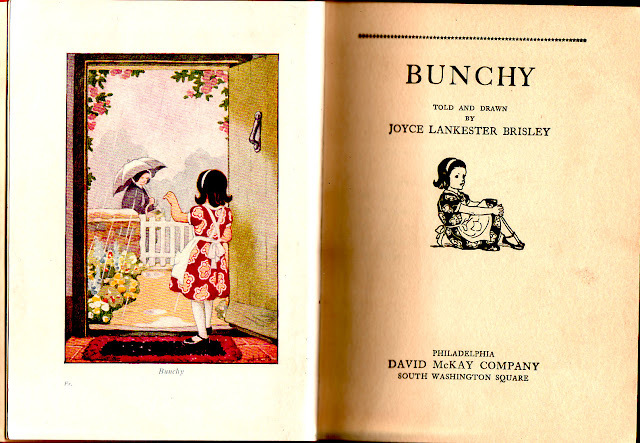 Well, here is BUNCHY, written and illustrated by Joyce Lankester Brisley. 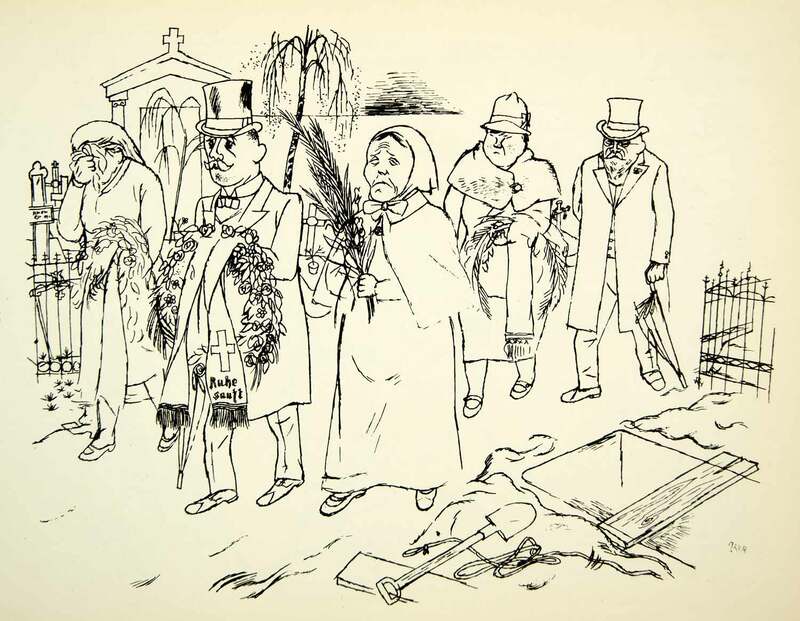 The cloth cover of the book shows a scribbled character. This is not Bunchy. 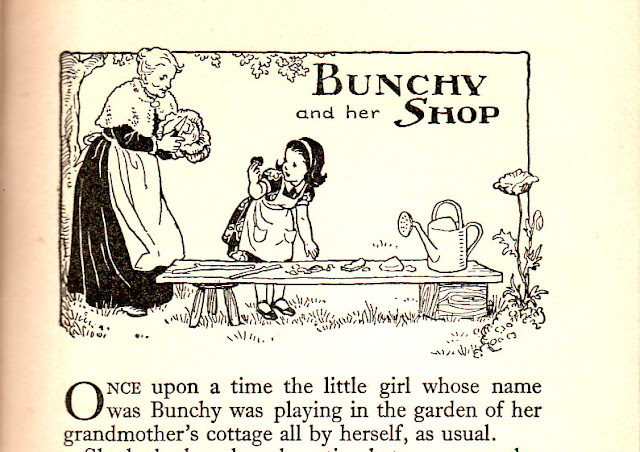 Bunchy is "a little girl whose name was Bunchy ... who lived with her grandmother in a cottage in the country." "There was only one thing missing, which was that she had nobody to play with." I don't know why her name is Bunchy. No publication date given (! ), but I've seen it given as 1951. But the style that Ms. Lankester chooses seems older. The book is comprised of 10 stories, all of which are about this nice little girl who makes up stories to amuse herself. 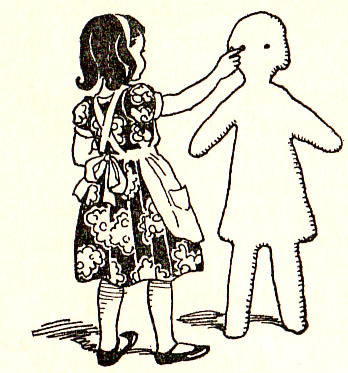 She will make little dolls out of wooden clothes pegs, make up stories about the buttons in a button bag, and so on. In the above drawing, Bunchy has set up a little shop while grandmother looks on. The stories all get out of hand as soon as grandmother is out of view, with characters coming alive and Bunchy no longer in control. Bunchy's absent parents are never mentioned. Perhaps they just couldn't handle our protagonist and abandoned her to her aged relative. Grandmother is frequently leaving the cottage, letting this underage child with the hyperactive imagination all alone. The girl has no toys, so she has to invent them. 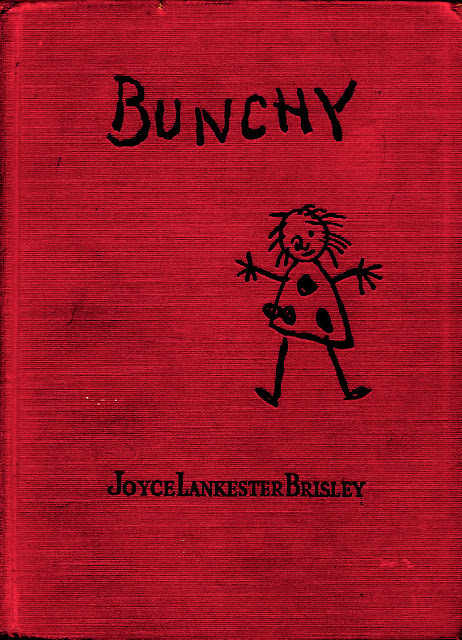 For instance, in "Bunchy and the Scribble Family," her drawings come to life, and she gets swept up in their world. 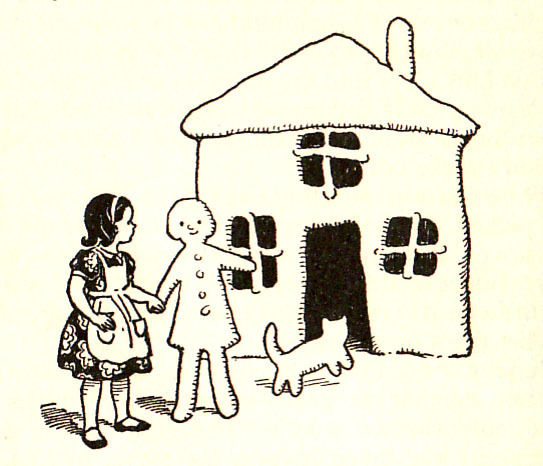 Mr. and Mrs. Scribble invite her to their house, and Bunchy has to run ahead to hurriedly draw their cottage. When they can't get in, she realizes she forgot to draw the doorknob. Their voices sound funny because she carelessly has drawn their mouths crooked. Each story has a title drawing and an introduction to our format. In "Bunchy and the Pastry Dough," grandmother leaves for the market. She has left a bit of pastry dough for Bunchy to play with. That's it. No Nintendo, no cell, no Facebook; just a cold, stiff wedge of dough left over from pie-making. "the little pastry-girl pulled her legs from off the table and jumped down with a soft thud on to the kitchen floor! "... The little pastry-girl began stretching her self as if she were doing exercises, but Bunchy soon saw that she was trying to get her arms and legs more to the same length, for Bunchy had really made them rather odd." 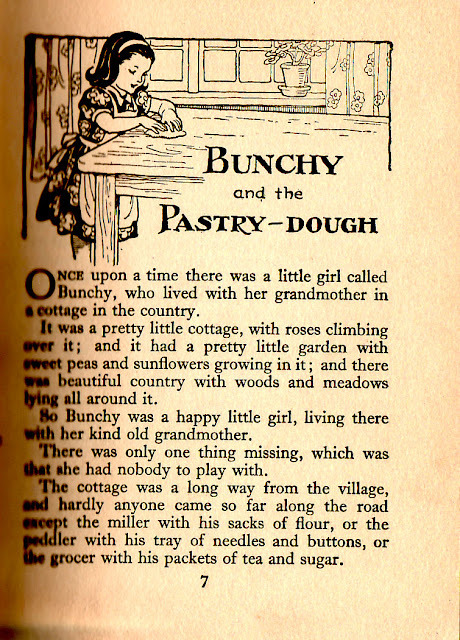 Bunchy realizes the pastry-girl has no eyes, so she places currants for eyes and, with a spoon, makes a line for the mouth. Bunchy makes a pastry-cat and a pastry-house. And then they go in the pastry-house ... and the inside of the house has a kitchen, rooms, furniture, which surprises our title character since she didn't "make" any of the inside of the house. "the little pastry-girl picked up the pastry-cat and set it on top of the stove. Bunchy was afraid it would be too hot there, but it settled down quite contentedly ...."
"a golden brown colour. The next minute the pastry-girl had taken it from the stove, broken it in crisp pieces, and piled them on the plates on the table. "Then she signed to Bunchy to draw up her chair and eat, and in some surprise Bunchy did so." 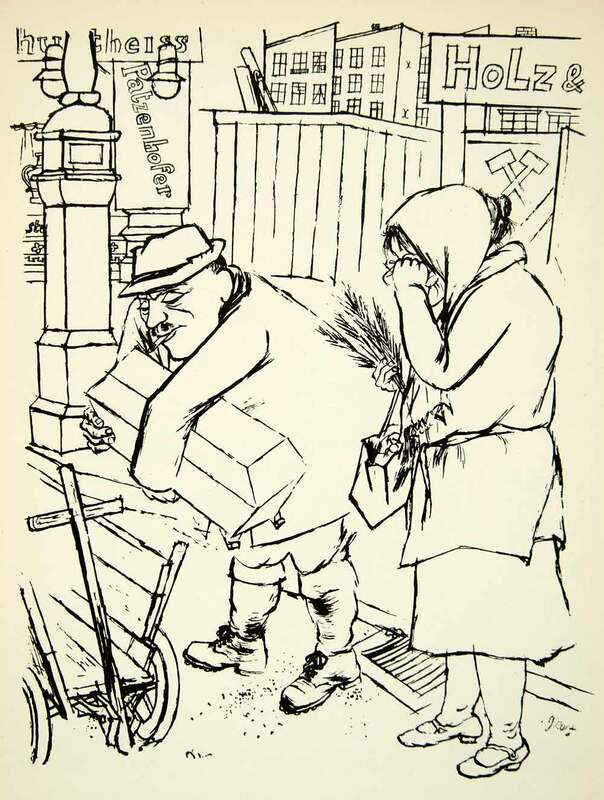 "When the meal was finished, the pastry-girl led the way up some funny rubbery soft stairs to the little bedroom above. 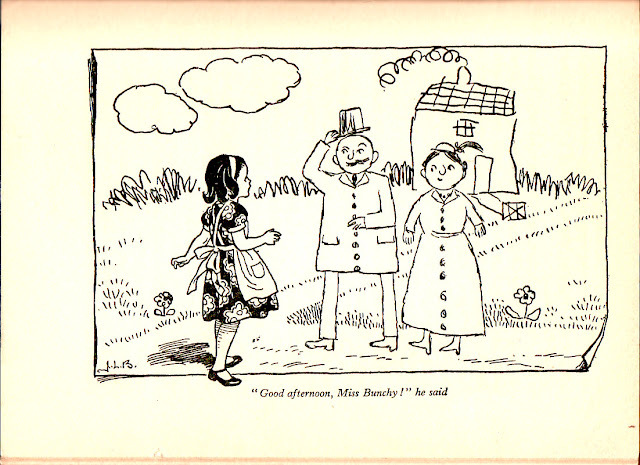 "Here was a white pastry-bed, with a thick pastry-coverlet; and the little pastry-girl at once pulled her buttons off (which were the only things she could remove) and got into bed, making room for Bunchy to get in beside her. 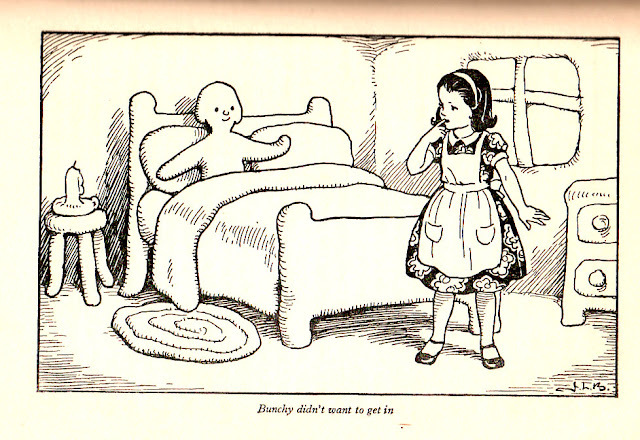 "But Bunchy didn't want to get in -- the bed-clothes looked so cold and sticky. Still the little pastry-girl kept beckoning and patting the lump of pastry which served for a pillow." Call the religious right! Call the CIA (both of 'em: the Central Intelligence Agency and the Culinary Institute of America)! This book is twisted and outta control! Thanks to Rob McGrath for the news article which reminded me of this little known book on my shelf! -- Originally blogged November 20, 2007. 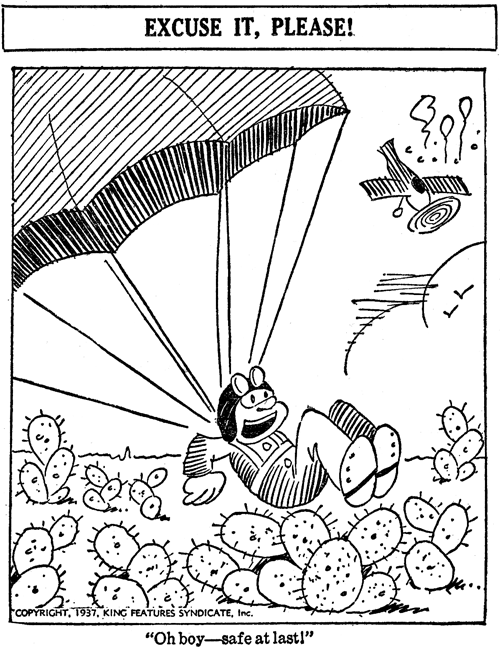 I'm really enjoying these scans that Sherm Cohen displays from the book THE KNOW-HOW OF CARTOONING by Ken Hultgren. Antique stores and flea markets have a wealth of graphic inspiration. Here are some photos from a few. The "W.C. Fields How To Be A Great Lover" novelty gift. This is a real gift that I saw in an antique store. You open it up and there's a fifth of bourbon in there. Actually, no. Upon second glance, it was Sarsaparilla Gold Cologne (whatever that is). The front of the box has the quote: "A magnanimous gift of wisdom to set the little chickadees all a-twit." Do they still make board games? Love the art on this. Antique shop exterior along Route 1. A commemorative plate. Somehow when I think "Six Gun City," I don't think of Jefferson, NH. The Show 'n Tell Phono-Viewer would play 45 rpm and 33 rpm records. Um ... ya'll know what THOSE were? Anyway, it also played these special records that came in a cardboard foldout holder, one side for the record and another held a filmstrip on a long card. You shove the strip in and play the record, and then the screen shows the slides automatically as the record plays. It was amazing. A metal snowman asks for a hug. Actually, that could be a pitch for a new TV series these days, huh? A very loving, sentimental poem on this pillow, which is now for sale in a dusty old shop. So sad. Lynda Barry: The Poetry Foundation "The View From Here"
Rube Goldberg talks about the notion of a perpetual motion machine in SOMETHING FOR NOTHING, a 1940 short. Omaha World-Herald editorial cartoonist Jeffrey Koterba describes his cartoon drawing process, from idea to finish. 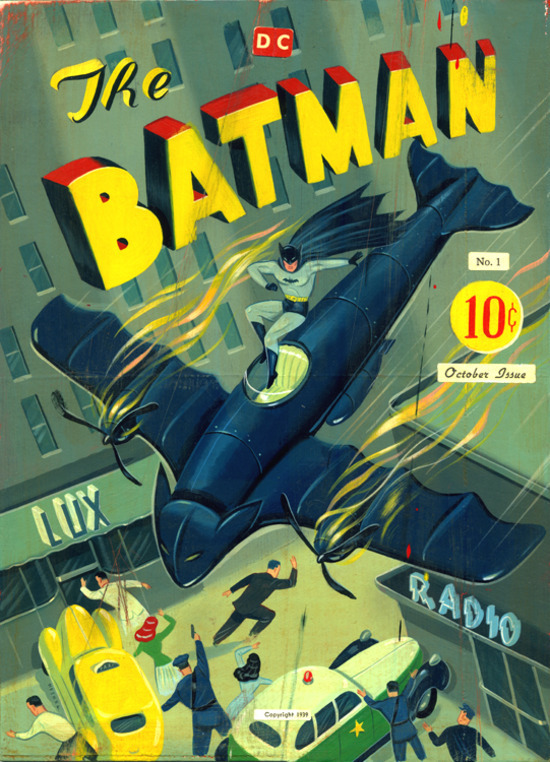 Gee whiz, I sure like Ryan Heshka's painting of an imagined BATMAN #1. Please consider making it into a poster or something fun! Okay, Ryan? Pretty please?!?!?! I was going to the store to buy a bot of wine. Minding my own business. This was going to be a quick in-and-out errand. But, thanks to cartoons, it didn't work out that way. Not "thanks to cartoons" per se, but thanks to people who presumably take cartoons without permission or payment to further their profit-making business. 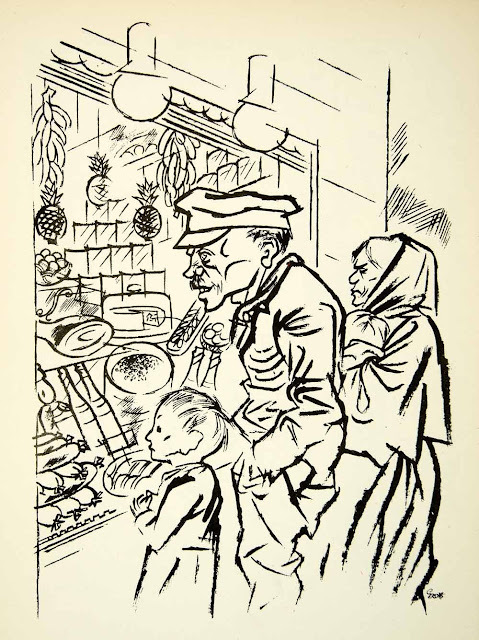 For instance: here's a cartoon -- a cartoon by J.C. Duffy for CartoonStock on this poster posted in the grocery store. You can see it has words on it to the effect that the store did not ask for reproduction rights. If an agreement was made, they would print a version without the watermark on it, yes? This is what I saw when I walked into the store: the store ripping off a cartoonist. Out of frame, when snapping this photo, was a bench and a woman sitting in it. She looked at me suspiciously while I was taking this photo. I don't know what (if anything) Cartoonstock will do to pursue this. I hope that they will when and if they see this. This is a large grocery chain in the Northeast. Thanks to cartoons -- maybe I should have bought two bots of wine. So, now, here is a major site taking other people's content and not asking permission nor paying for it. My take: I don't care if a person takes one of my cartoons and posts it to Facebook just for fun. But a business knows better. 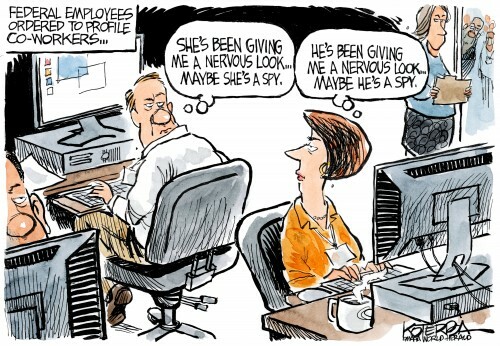 Is the whole world like that lady on the bench, stink-eyeing me passively when I draw attention to a corporation taking a cartoon without the cartoonist's permission? The Stripper's Guide shows us some panels from King Features' EXCUSE IT, PLEASE! by the screwball cartoonist George Swanson. The great screwball cartoonist George Swanson, who signed himself 'Swan', managed to turn wild success into abject failure. 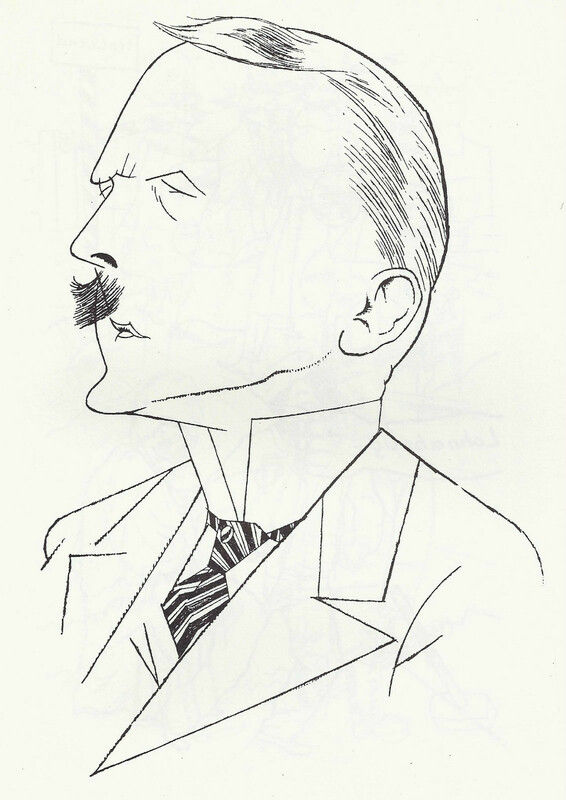 I say that because for a full decade (1927-37) he produced the 1-column panel Nonsense, which ran in a huge number of papers. But then either he or King Features decided to scrap Nonsense and replace it with this 2-column panel with the ungainly title Excuse It, Please. 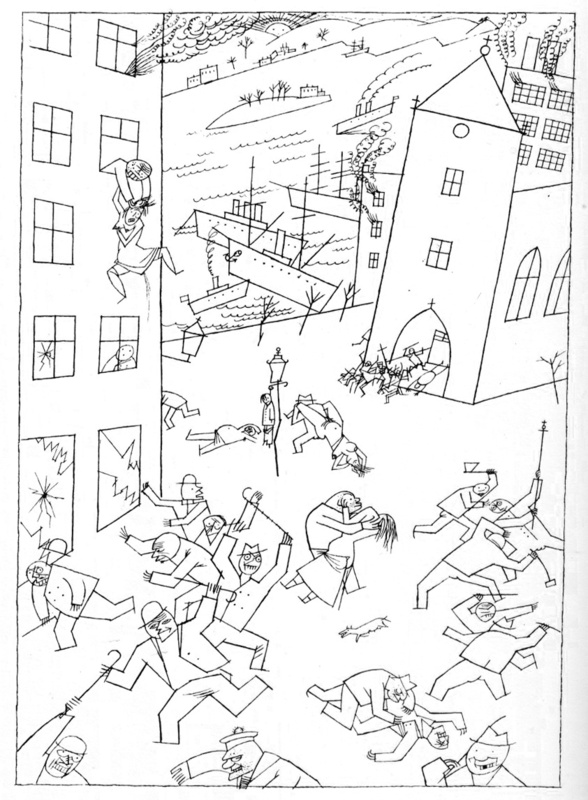 It did give Swanson a little more elbow room to draw, but the new panel, which used stand-alone gags without a unifying theme, pointed out that Swanson's gift for slapstick and silliness didn't necessarily make him a good single-panel gag-man. 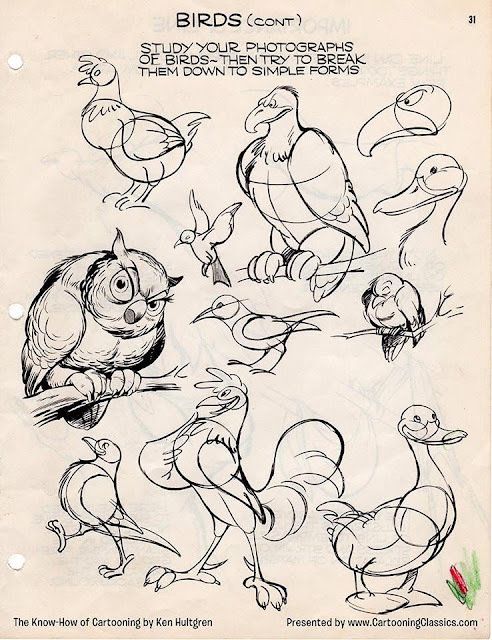 Swanson could produce a few good cartoons per week in this format, but the rest were right out of Joe Miller's jokebook.Excuse It, Please debuted on October 23 1937 and the last its been seen was April 2 1938. 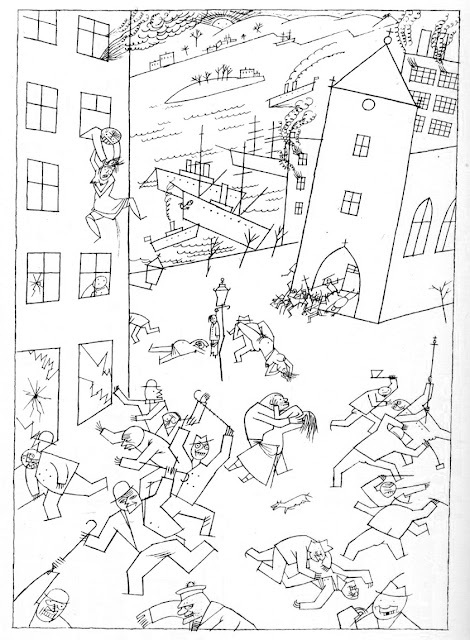 "Riot of the Insane" by George Grosz, 1915. 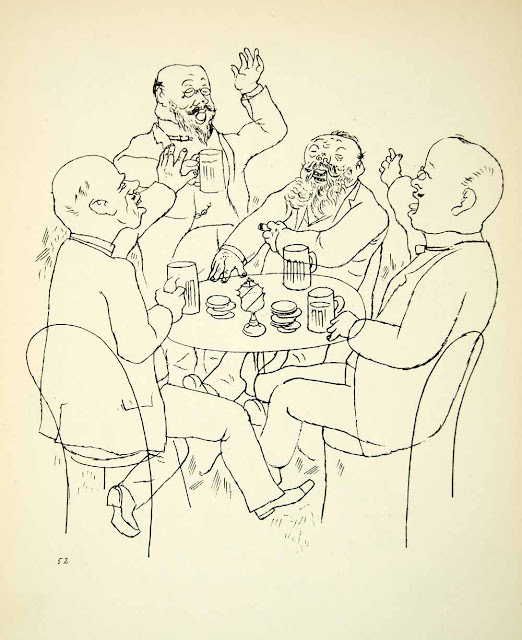 “It was my first encounter with the works of the German artist George Grosz, when I was in my twenties, which showed me that drawing need not just be a space-filler in a newspaper: in the hands of an honest man, drawing could be a weapon against evil…." 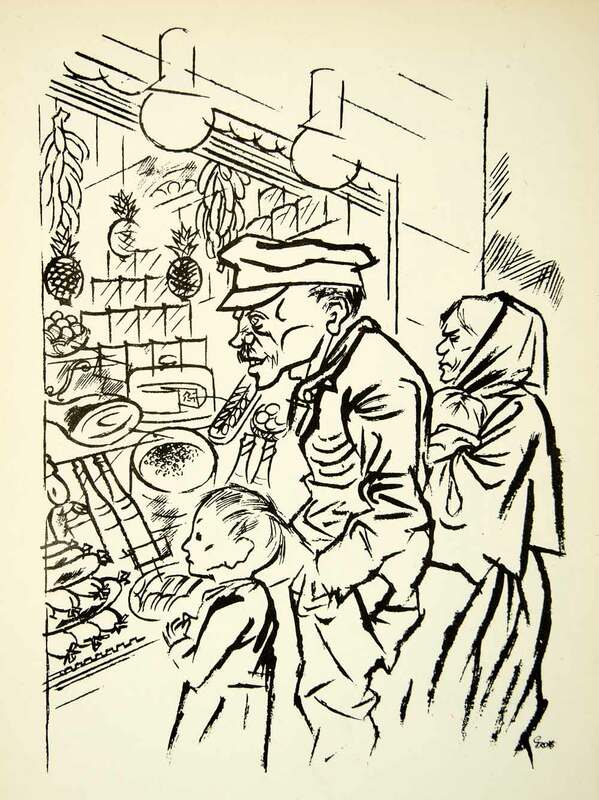 Haunted by the Great War, George Grosz was an artist -- arguably a fine cartoonist -- whose work has impacted others for generations. Above: "One Little Angel More. One Conscript Less?" 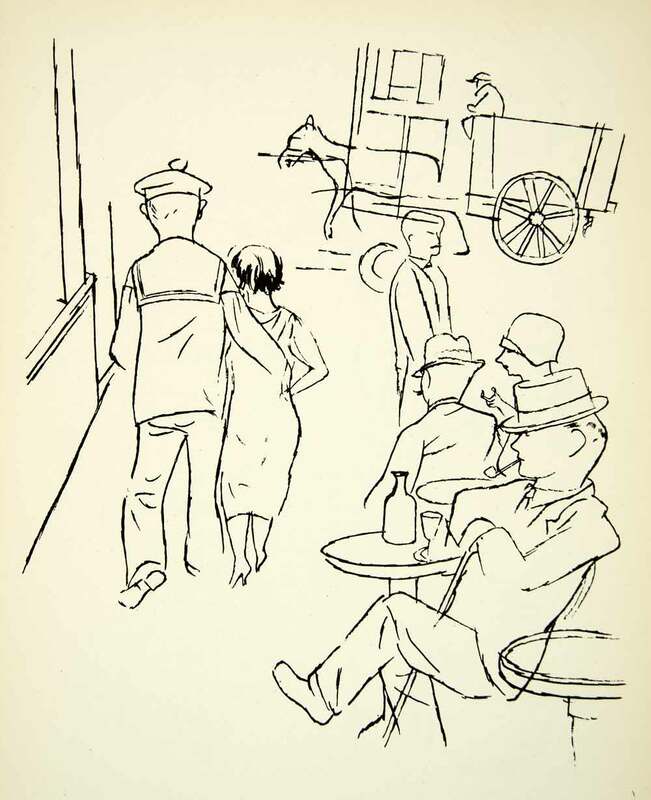 a 1948 lithograph. 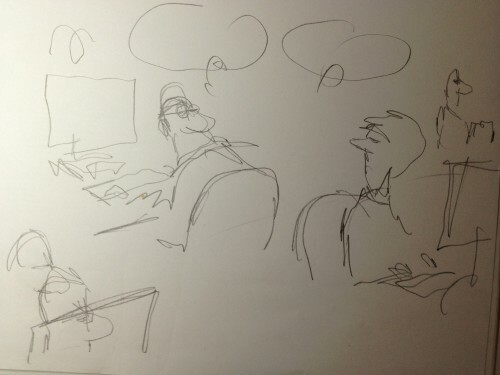 Austin Kleon has a fine article on the man here. As for me, I'll just post a few images this morning so you can see for yourself the power that these drawings still have.